DOGIPOTďż˝ Pet Stations provide the perfect tool to encourage dog owners to clean up, leaving less work for maintenance/park staff. The high quality materials ensure long lasting solutions and lower maintenance costs. DOGIPOTďż˝ products were specifically designed to keep dog-friendly areas and their surroundings free from dog waste and its harmful impact on these areas. 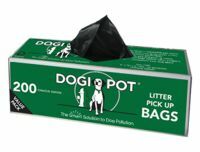 DOGIPOT® SMART Litter Pick Up Bags™ are the most effective, dependable and economical tool used to help eliminate dog pollution in dog friendly areas. They are the perfect pickup tool that provides the perfect balance of dependability and value. It's the dependability that saves you money!